Windproof and water resistant, the comfortable and highly breathable Women's Elite Barrier vest provides lightweight, packable core protection from the elements. Pearl Izumi uses Elite Barrier fabric to provide superior wind protection and water resistance. A full length internal draft flap with zipper garage seals in warmth, and Direct-Vent panels provide superior ventilation. A single zippered rear pocket provides ample space for all your items. Reflective elements front and rear. 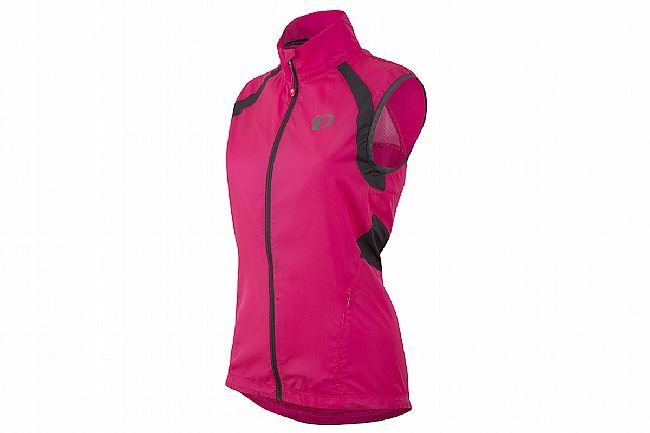 The Women's Elite Barrier Vest features semi-form fit and is available in various colors. I cycle in temperatures from 30 degrees to 100 degrees. This is the one essential piece of cycling clothing. I am on my fifth (at least) vest. I rarely wear a full jacket anymore, since discovering the cycling vest over 30 years ago, I just layer, layer, layer, and this piece almost always is the one that remains on my upper body when taking other items of upper body cycling clothing off. This is the most versatile of all cycling clothing. I live in Phoenix, but until recently I lived in Pennsylvania where I also cycled year round. Don't be fooled. . .we get below freezing temperatures in Phoenix also. Buy it in screaming pink, it's just as visible as the yellow, and you'll get tons of compliments!! !